Defining a Transformational Arc is the second step in a three-step sequence of an integrated business “excel-leration” process for corporate renewal. For an introduction to the overall process, check out our post on the Three Steps to Business Transformation. Earlier phases of the business “excel-leration” process defined the beginning and end state targets in several key areas, as described in the post on defining the Transformational Goal. 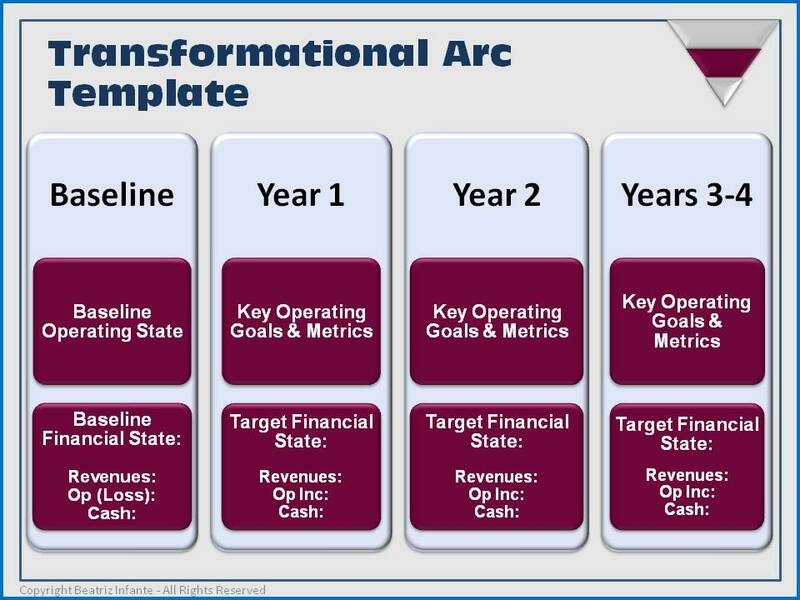 The second step, described below, defines the overall target timeline and intermediate metrics for the transformation to be successful, which we call the Transformational Arc. The Transformational Arc consists of a baseline and a set of future timeframes. Each timeframe includes one or more primary operating activities, and target financial metrics to be achieved by the end of that timeframe. The primary operating activities are sequenced over time and tied via the operating plan to the financial results. The financial metrics should, as a minimum, include revenue, operating income (or loss), and ending cash. For example, the baseline for a company may be a loss situation combined with revenue decline from prior years, combined with excess facility capacity due to anticipated hiring delays. 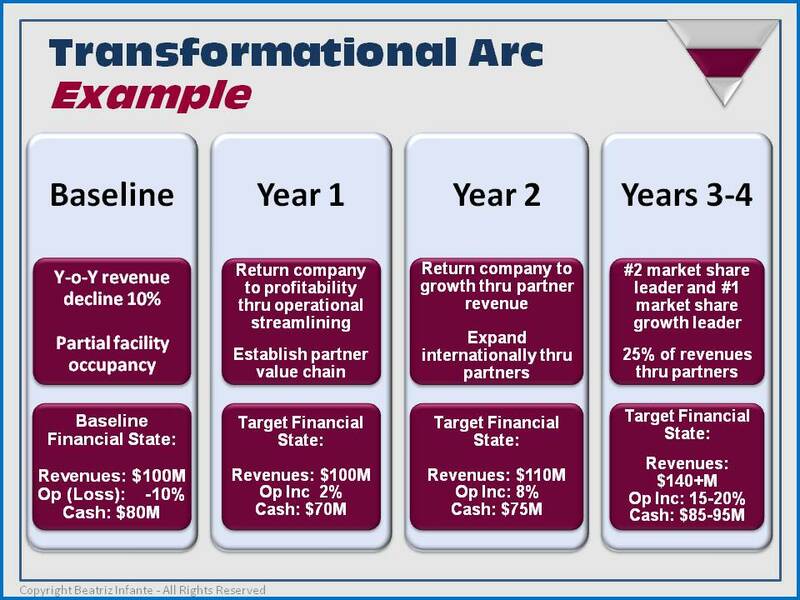 Year one of the Transformational Arc may require workforce adjustments to return the company to profitability on a non-GAAP basis, as well as laying the foundation for future growth by signing partners for indirect revenue, and consolidating facilities. Year two may see a return to revenue growth through partners, and years three to four see both revenue and market share growth. 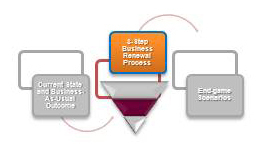 What is the sequence in which the company achieves the desired end state as defined in the Business Transformation? What are the concrete visible intermediate milestones, and the criteria that signal that these intermediate milestones, and ultimately, the end state, have been reached? How long will it take to get to each of the intermediate milestones? What is the potential variability in results, the range of potential outcomes, and the range of actions that must be taken? More importantly, what is the required timeline in which these actions or milestones must occur so that the company does not slip into a Business-as-Usual outcome? What financial resources are required to achieve these milestones? Can the company both accomplish new directions and maintain its current business without high levels of risk? Working backward from the end state, what is the sequence of actions required to achieve that end state, and are the “working backward” milestones compatible or incompatible with current state? For example, if the intermediate milestone in two years is to derive a percentage of revenue from distribution channels, and you don’t have a channel-ready product today, and it will take at least a year to develop such a product, your timeline probably needs to be closer to three years – one to develop the product and 18-24 months to develop an effective and functioning channel. It is very important to note, however, that a draft of the end state, transformational arc, and timeline that you develop is exactly that – a draft. 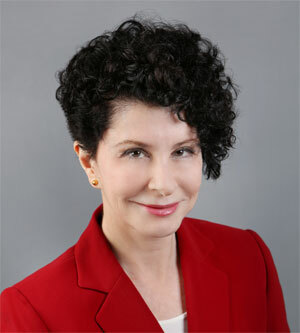 It will take weeks, and in some cases months, to find all the issues and uncover all the problems, as well as talk to customers and market-test your strategic direction to fully align your operating plan with the strategic direction., There can be no substitute for time spent on these issues that must be conducted in collaboration with a skilled and competent management team. It may be that as you delve deeper, major elements of the strategy may need to be altered. Nevertheless, keeping the Transformational Goal and the Transformational Arc as living documents will let you refine the plan and to better track the changes. Read the next blog post in this sequence.